'My Life Feels So Empty' Really?! 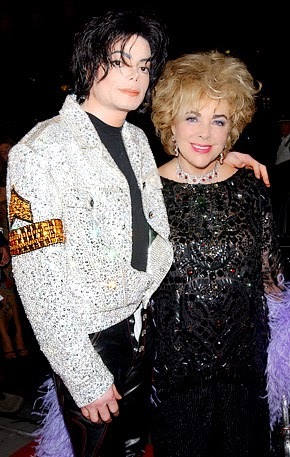 Elizabeth Taylor released a statement about the death of Michael Jackson. "My heart…my mind…are broken," the statement begins. "I loved Michael with all my soul and I can’t imagine life without him." Midway through the statement, Taylor says, "My life feels so empty. I don’t think anyone knew how much we loved each other." Now, I don't wish to cheapen or mock the friendship Taylor and Jackson experienced. It's not my place to judge that whatsoever. But how many other people, fans, and gawkers who didn't share anything close to their relationship are claiming they feel the same way? I've been amazed about this outpouring towards the King of Pop. He was barely an itch in most people's ears for the past several years. More often, he was likely the punch line of a joke before being a fond memory or appreciative thought. When was the last time you listened to one of his songs? A super-talented superstar whose eccentricities nearly drove him mad, into seclusion, and out of people's thoughts was until recently planning on saying goodbye via 50 concerts. Our morbid curiosity scratched, we stumbled forward to see what this strange little man was up to. Suddenly, he was a bookend on a day when another celebrity loss her battle with cancer. Thus began the continuous onslaught of news coverage, the throngs of people in the streets, and merchandise being sold and invented, the celebrities tweeting their words - written and spoken - about Jackson...everyone stumbling over themselves like some massive blubbering wave of a gelatinous life form. It's an amazing and sickening spectacle of the human condition. Please, don't misunderstand me. This was a human being, man, son, brother, ex-husband, father, and a multi-talented superstar. He was many things to many people and his passing should be mourned. But what if we only cared about those around us as much? What if we invested that sort of energy in our relationship with God, our family, and friends? How much richer our lives would be! Consider the amount of time spent seeking the latest media about his death and life, watching online videos, staring at endless TV reports, reading magazine and online stories, and stores are selling out of his dust-covered music collections. My challenge is for fans to take their feelings and energy and direct those to prayers for the family and children. Pray for their healing, comfort, and saving knowledge of Jesus Christ. God can be glorified in any situation, no matter how small or large, no matter how carnal a situation may seem, if only His people would humble themselves and pray. Why does it take someone's death and massive throngs of people reacting before we appreciate someone? Like the song says, "You're Gonna Miss Me When I'm Gone." thanks for this post. you wrote what has been on my heart since yesterday. i appreciate his music, simply because it was such a soundtrack to my childhood, as is the case for so many. i don't understand the idolatry, though, after the past few years of ridicule. thanks for your insight. "It's an amazing and sickening spectacle of the human condition." It's like all writers go to the same writing school and try to sound intellectual all the same. It has nothing to do with the "human condition", whatever that old tired krap means. He is a superstar, people lived many highs and lows of their lives through his music and his reach... people can relate to him JUST LIKE family. If you don't feel it, fine...just don't say it's sickening like a pseudo-intellectual wet blanket. I agree with you 100%. So many people have an abnormal attachment to celebrities, in general. Yes, his music was experienced through highs and lows of my life too, but that doesn't mean that it is normal for me to feel like they are family! Abnormal attachments, such as that, need psychological intervention. Anonymous, thanks for sharing your comments here. I disagree, this spectacle has everything to do with the "human condition" but if that's to abstract or lofty a phrase, I'll explain further. The human condition here is the inescapably of our being human: our need to idol worship, our shallowness in mocking and joking about this man one day - wailing and fainting with the grief the next. For those who have always supported him and have remained consistent and real, that's how it should be. However, we all sometimes need to be reminded how much we should love our own families and friends, since it's easier to show love and adoration for someone we only know from afar. I was not one of the fans wailing and making Mecca-style trips, or one of the hypocrites who mocked him. I knew of his skin condition, the broken nose which forced him to have his first surgery, etc. I did cry however the following day because so many of my childhood memories are associated with MJ. I wasn't however one of those who dismissed him when he was brought up on charges either. I spoke my opinion just like everyone else. I analyzed the case and spent hours watching CourtTV and came to my own conclusion of his innocence. Growing up in a household where the parent was a huge fan of MJ dating back to the J5 era, a person cannot help think of his music as a soundtrack to their lives. I think you are mistaken when it comes to the human condition and its capacity for love. We can love those near and dear, and those not in our lives, so to speak. I grieve for all life. I have seen more friends and family take to the other side in the past five years than anyone should endure, including my father. You state that we should love our friends and families in the same respect but, that is not always the case. There are those who come from broken, abused homes and flow their love into other things. And in all cases, sometimes that love isn't returned. People show their families love and adoration in other ways. I find it difficult that you are constantly telling those in your life your feelings about them. You are human and nothing is ever easy as it sounds. And btw, people seek comfort in The Lord mostly when someone dies.. Even though the should be seeking him before. Don't get me wrong I liked your post. You know I'm 46 and originally from Detroit. And if it makes a difference it surprised me how much his death effected me. I think for people my age we may be mourning are youth. And besides the 80's was a good decade for me. You know it's not a horrible thing that people are shedding a few tears for him or maybe ourselves. I never ever, felt like I knew him or wanted to be him. I just loved his music and the way he moved. And more importantly they way I still feel when I hear one of his songs. Can't it just possibly be, it's as simple as that? Anonymous, thanks for sharing your two cents. Thanks for expressing your stance and thoughts on Michael. Perhaps you misunderstand my thoughts on the human condition and its capacity for love. There's great capacity there and deep feelings. However, sometimes, that's all that's there...feelings. Nothing more than a flash fire with nothing left behind. Sadly, unconditional love is very difficult for humanity. Often the love comes with strings attached - what's in for me? You're correct, nothing is as easy as it sounds and it's rather impossible (and unwise) for myself or anyone to constantly be sharing our feelings and showing love and adoration to our family and friends. My point is that it's often too easy to show that love to someone we barely know and devote hours to that love than make an effort to help or love our family and friends. Indeed, it's easy to seek the Lord in times of death and trouble. But we need to seek Him in the good times, too. Thanks for sharing your thoughts. Anonymous, thanks for dropping by. You're right, some things are very simple. I, too, am saddened by the loss and the comparison of him and his music representing one's childhood is important and accurate. Shedding tears for Michael is good. My caution and challenge is to channel those feelings and passions into people around us soon. I just feel so sorry for him, if I hear Ben or I'll be there. He was such an innocent, beautiful little boy that grew up in a world that was full of hate. He had no one to protect him, God, how I HATE!!! his dad for messing him up. Someone should have protected him against the world, against himself. His parents, his friends. It's all too late now. I'm crying my eyes out. God will protect you now!